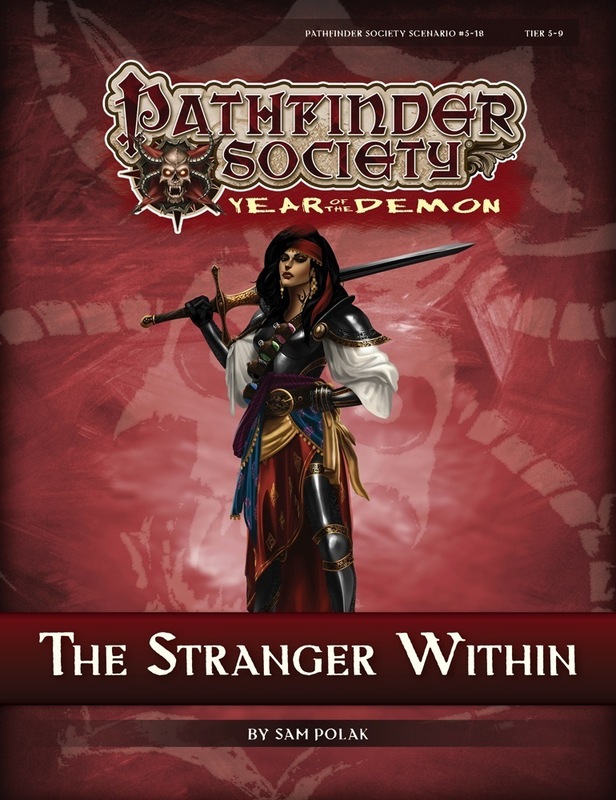 Content in "The Stranger Within" also contributes directly to the ongoing storylines of the Andoran, Qadira, and Sczarni factions. I played this scenario with a party of four on low-tier for 6-players due to the levels of our characters. The best selling point for this scenario has to be Kaer Maga. This city continues to be as vibrant, silly and unique as we’ve all come to love in previous scenarios. I agree with Magabeus (who was the GM and who wrote a review below) that it’s best played after you’ve completed the two City of Strangers scenarios. In other words: the setting is amazing and the NPCs are outstanding, even though the way to do the ‘Andoran’ mission struck me as completely nonsensical. The scenario want to be an investigation, yet is nothing more than a dungeon crawl spread out across the city. In other words: it is straightforward even for a railroad adventure. Thankfully you can tackle some of the encounters in multiple ways, but it’s not enough of a sandbox to really be classified as an investigation. For me that was a bit of a letdown. The encounters are fresh and memorable, even though the last one can really take over an hour to finish. The foes either catch you by surprise or have some sort of unique twist to them. I enjoyed them a lot. That said, the flunkies in the last encounter are a bit odd. Why are they even there? And why are they more scary than the actual boss(es)? We definitely struggled, partially due to really bad tactics from us a party, and we could have suffered some casualties. We managed to pull through however, making the final combat memorable but awkward. Just because of the setting I'll recommend this scenario, but I can't in good conscience say this is one of the better scenarios I've played. It's too much of a railroad for that and I don't consider the storyline to be that solid either. Stranger is a mix of investigation, problem solving, combat, and roleplay. The premise of the scenario is an investigation, but the investigation portion is railroaded and all of the clues are hand fed to you. Having said that, each encounter is a sandbox and are open to creative solutions to solve them. In general the encounters were interesting and enjoyable. Length: Medium (4 hours) and I think we skipped the optional. Experience: Player at subtier 8-9 with 6 good characters. I played this at low tier with the 4-player adjustment. The scenario builds great on the season 2 series City of Strangers. Some NPC's are revisited and the setting is well-done. If you have never been to the city of strangers: play the series first as you will likely appreciate this one better if you have played those. The investigation is rather straight forward and felt a bit like a series of fetch quests. Also it was obvious from the start who we needed to find, a bit more mystery which of Guaril's rivals is behind the attemps would have helped. The number of combats was rather low, due to some creative thinking and a certain druid PC. However one of the combats that we did have was very tough. We managed to defeat the enemy with most of our PC's having just a few hitpoints left. My staff magus uses most of his daily arcane points in this combat, trying to go for a better allotment of enhancements on his staff. Great! We encountered a monster from Tian Xia. Why? What is the background? I know that Kaer Maga is the City of Strangers, but Tian Xia is a great distance away from Varisia. On an out of character level it annoys me that there was no explanation given. I do not know if this is due to our GM not relating this information (I did not ask for it) or if this is not given in the scenario. Kaer Maga is one of my favorite among the Innersea, wonderful investigation and talk with memorable NPCs. You must definately love it, especially for Liberty's Edge players. Not many combats but the final one is challenging too. The only drawback may be the setting of Freeman, a little weird. Cousin Karela ! Hang on ! We are going to save your hide !!! Penny an' I look forward to the new sights to see. Yes! The Sczarni metaplot has been my favourite this season. Happy to see another scenario my Sczarni character can play (just barely). Great, I'm looking forward to returning to Kaer Maga. Thanks for doing this! Kaer Maga is one of my favorite locations! Was rather disappointed in this scenario to be honest, as it felt a lot like a redone City of strangers part 1... though not as well done. Which is sad because Kaer maga has so much fun to offer players. Then again I only played in it and haven't read the full thing, but that was our general impression at my table.